Amanda Quinby has been working as a picture frame conservator for over twenty-five years. 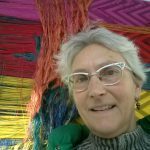 She began learning the craft as an apprentice custom frame maker while in graduate school in North Carolina. She established her own business as a conservator in 1992, specializing in antique gilded frames. 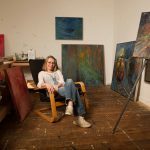 In 2000 Amanda moved to the Pioneer Valley and continued her work from her studio at 1 Cottage Street in Easthampton. In recent years, Amanda’s focus has shifted from frame conservation and restoration to gilded art on panels. This work grew from an appreciation for the history and practice of the gilding craft and her desire to explore and expand on its traditions. Amanda uses traditional materials and techniques that have not changed much since the Middle Ages but applies them in new and non-traditional ways. I am interested in texture and color. I make my own gesso from finely ground chalk and rabbit skin glue. I apply 7-8 layers to the panel before beginning the final “drawing” or texturing of the surface with several more layers of thickened gesso. The colored undercoats, a blend of clays and rabbit skin glue, are also a traditional material that I make use of in non-traditional ways. The leaf itself provides yet another range of colors and characteristics, depending upon karat. I work with gold ranging from 12k to 24k but also include silver and palladium in my palette of precious metal leafs. Her client list includes Duke University, The North Carolina Museums of Art and History, The mead Museum of Art at Amherst College, Historic Deerfield and historical sites such as the Thomas Wolfe House, as well as galleries and private individuals throughout New England, North Carolina, and Arizona.